Just about three months ago, I wrote an entry on the “dining” table I built to be the foundation of my apartment woodworking shop (post linked: here). During its construction, I had envisaged the table (which, by the way, was reverse-engineered from a Restoration Hardware design) as a furniture-quality, rock-solid clamping surface with some much-needed storage space on the shelf below. And, thus far, it has not disappointed. I believe I executed pretty well on that concept. 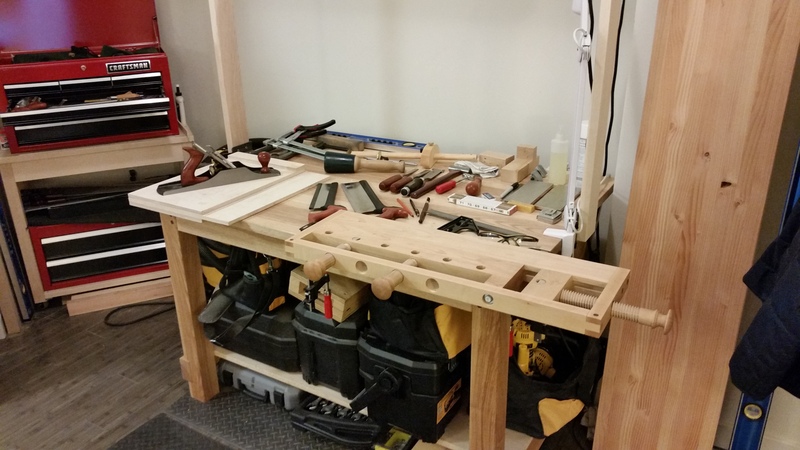 There is no hint of wobble or bench-based chatter when I am hand planing, and I have (just barely) enough storage below for the powered odds and ends I thought I would use when I switched back to apartment-based woodworking (more on that another time). The height (at 31″) is just right for planing, with the top of the Milkman’s Workbench sitting at a very comfortable 33″ (I’m a little over 5’10” and all my planes are iron-soled, FYI), but I still need to craft a moxon-style vise to raise the workholding to a comfortable level for joinery. The top is wide enough (at 50″) to accommodate both the Milkman’s Workbench and a shooting board/miter box at the same time, but not nearly wide enough for planing longer, thinner boards (hence the need for a 72″ planing slab (seen above on the right, planed to final dimensions but still lacking dog holes and inset vise)). The top is deep enough (at 34″) to splay out the tools needed for any particular project, but is sadly too deep for the reach of the boom on my LED task light (solved by locating the clamp-on base to the side, which now gets in the way of some cross-grain planing). The overhang of the top in relation to the frame is wide enough (at 4″) for ease of clamping a variety of benchtop accessories on all four sides (e.g., Milkman’s Workbench, miter box, saw vise, task lamp base, soon-to-be planing slab), but anything less than a co-planar top eliminates the usefulness of the legs themselves as a clamping surface. The point is, no matter how well you plan, no matter how much thought goes into the design or care goes into the execution, it is only a matter of time before the shortcomings and mistakes become apparent. In making the best of a less-than-ideal situation, any solution to an existing problem could also be the genesis of a new, unforeseen issue. And that, more than anything, is the essence of small-space woodworking. I really like your table design and your ability to change the setup for the task at hand. I recently saw this video from Fine Woodworking about a small mini workbench to raise work up for detail work, which includes dog holes and a vise. I have been thinking of making one of these to help out in my apartment as well since it is a small space. Thanks, Paul! Welcome to The Apartment Woodworker! When it comes to changing the work level for certain tasks, there are quite a few solutions: for example, the moxon vise (like the ones available though benchcrafted) or the benchtop bench (the one you saw is probably from a mid 2000s article and used veneer press screws) will raise the work, while flip-down feet will raise the bench itself. Sometimes, though, the best solution is just to have a seat, and a saw bench works great for sitting while sharpening or sawing.